We’d love your help. Let us know what’s wrong with this preview of How Do You Say Good Night? by Cindy Jin. Snuggle up and learn how to say “good night” in ten different languages with this heartwarming bedtime board book! A lovely bedtime follow-up to How Do You Say I Love You?, this sweet lullaby featuring adorable illustrations by Shirley Ng-Benitz is the perfect way for parents to wish their little ones a good night’s sleep. 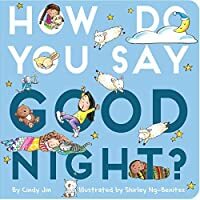 From Mexico, Vietnam, Kenya, and beyond, this charmi Snuggle up and learn how to say “good night” in ten different languages with this heartwarming bedtime board book! To ask other readers questions about How Do You Say Good Night?, please sign up. Be the first to ask a question about How Do You Say Good Night? How do parents say good night to their little ones all over the world? Simply and sweetly, but in many different languages. Featuring "good night" in 10 different languages, each is introduced with a short poem that usually rhymes with the pronunciation. Illustrated with full color renditions of cultural families enjoying the end of the day together, the name of the country and a phonetic spelling helps the novice language speaker say it right. For this and more of my reviews, visit https://kiss How do parents say good night to their little ones all over the world? Simply and sweetly, but in many different languages. This board book give the words for goodnight in many different languages. I appreciated the pronunciation guide.